>Click "refresh" to find wireless devices. Next, move the mouse to the device you want to set up and right click. You will see two options, left click on "Networking". A new window will open as shown below (notice the two tabs, Networking and WiFi). 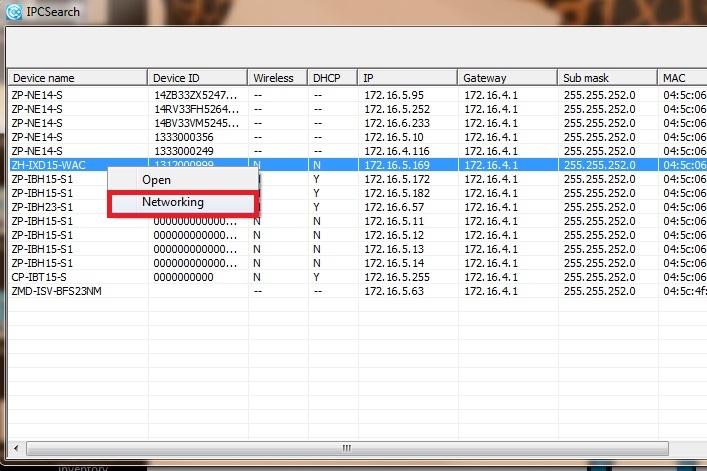 First, click on the the "WiFi tab", uncheck the DHCP option at the top. Next, enter the IP address and gateway as needed to work with your router. You will want to open the camera in an Internet Explorer browser. Example, if the IP address you gave the camera was 192.168.1.50, then you will type http://192.168.1.50 in the browser's address bar and then hit enter. Once you get to the login screen, be sure to enable compatibility view in the browser settings (In IE, tools>compatibility view). You will need to login with your username and password. Click on the gear(settings) the go to the Network section and make sure you uncheck DHCP and save the settings. You then want to click on Wireless Settings. You may need to fill in the proper IP address information to match the settings you entered earlier. You will then double click on the wireless router that should have come up in the list below. You will enter your wireless password and choose connect. It should say succeed and then you will choose save. After both options succeed you can close out of that configuration box. ****WEP is not an acceptable security key option and the camera will not accept any WiFi network with this type of security encryption. You must use WPA/WPA2.